January 17, 2019 – 2019 marks the 30 years of the Berlin Wall’s fall. To honour this historical milestone, a series of coins will be launched by the Monnaie de Paris just before the Berlin Fair. 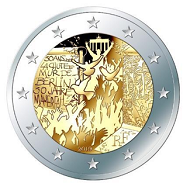 The 2-euro commemorative circulation coin features a design by Joaquin Jimenez. A 2-euro commemorative coin drawn by Joaquin Jimenez is offered in proof quality, brilliant uncirculated and common metal. It will be marketed the 1st February 2019. The obverse shows a falling part of the Berlin Wall. It opens on a German crowd having arms up meaning victory. Three doves, as a peace symbol, are flying overhead this crowd. The doves have their wings spread in V, also meaning victory. On the left, “30 ans de la Chute du Mur – 30 Jahre Mauerfall” is written. The reverse of the coin is that of a standard 2-euro coin, found throughout all countries of the eurozone. The face value “€2” appears in front of a map of Europe. The commemorative silver coin will be issued at a face value of 100 euros and 10 euros. Two face value coins will also be launched the 1st February 2019: a silver common 10 euros and 100 euros. These coins are also drawn by Joaquin Jimenez. The obverse shows a falling part of the Berlin Wall. It opens on a German crowd having arms up meaning victory. Three doves, as a peace symbol, are flying overhead this crowd. The doves have their wings spreaded in V, also meaning victory. 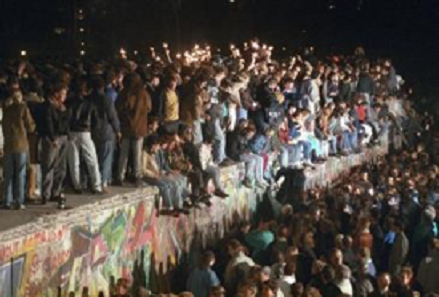 On the left, “30 ans de la Chute du Mur – 30 Jahre Mauerfall” is written. The reverse bears the face value of 10 euros or 100 euros surrounded by branches of oak and laurel evoking the Euro sign. The whole motive is framed by traits representing an Hexagon. These commemorative coins are struck from .999 gold. The obverse of the coin shows the Brandenburg Gate, previously on the East side, Crowned by the quadriga of the Greek goddess of Victory; it is one of the strongest symbols of Berlin and of Germany. In the center, a soldier holding a rose, goes through the wall as an allegory of the fall of the wall. “Berlin” is written in a tag way on the wall. Below the coin, “30 Jahre Mauerfall” is written. It means 30 years of the Fallen Wall. 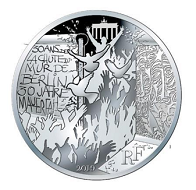 The reverse shows the background of the Berlin Wall with the words “30 ans de la Chute du Mur de berlin 1989-2019”, and also the face value and the RF inscription. On the right hand side stands the Tempelhof airport, symbol of West Berlin. On the left, a bear, mascot of Berlin city, is symbolically pushing the wall. 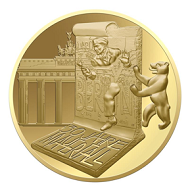 This commemorative coin marking the Fall of the Berlin Wall is struck in a special shape. The obverse of the coin shows the Brandenburg Gate, previously on the East side, Crowned by the quadriga of the Greek goddess of Victory; it is one of the strongest symbol of Berlin and of Germany. In the center, a soldier holding a rose, goes through the wall as an allegory of the fall of the wall. “Berlin” is written in a tag way on the wall. Below the coin, “30 Jahre Mauerfall” is written. It means 30 years of the Fallen Wall. For this series, Monnaie de Paris innovates by offering a shaped coin with an optical illusion. 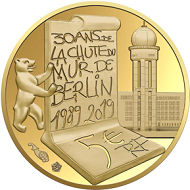 On the reverse, “30 ans de la Chute du Mur de Berlin 1989-2019” is like handwritten honouring this major event kept in mind by many people. The face value and the RF inscription also appear. A photo of people who climbed the Berlin Wall on November 9, 1989. Built during the night between the 12th and the 13th august 1961 by the German Democratic Republic, the Berlin Wall or “Wall of shame” for the Western German, has been made in order to stop the escape from East to West. Western and Eastern Berlin have then been divided for more than 28 years. It became the symbol of a divided Europe by the iron curtain. A lot of people who tried to cross the wall also gave their life because of the strong military device. More precisely, there were two walls of 3,6 meter-high, with a covered way, 302 watchtowers and warning devices, 14 000 guards, 600 dogs and barbed wire up to the sky. Following the weakening of the Soviet Union and the rebellion of the Eastern German, the wall has been demolished the 9th November 1989. It then allowed the reunification between Western and Eastern German. This fallen wall is kept in mind of many generations. Symbol of the ideological and political division of the Cold War, the Berlin Wall inspired many book and films. Some museums are dedicated to this fact. Nowadays, the Berliner capital-city is still keeping scars of this “wall of shame”. More information is available on the Monnaie de Paris website. Original footage of an NBC correspondent reporting live from the Brandenburg Gate on November 9, 1989 is available online. History.com tells you more about the history of the Wall.